Today tech is beyond prevalent in what we experience with brands but it was at the recent Food Loves Tech Expo where the fusion of these two worlds collided in a perfect union. Food meet tech, tech meet food. 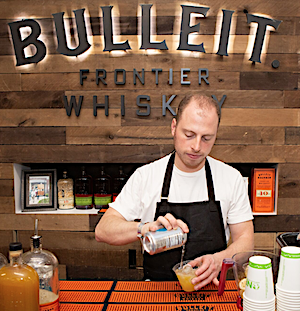 This year we experienced, along with 3,500 other food enthusiasts some innovate brands from SproutsIO, Oatly, Equinox, Bowery Farming, The Honest Bison, Brodo, Real Eats and more. Brands need to always be creative in how they utilize tech in order to really invite customers to evoke curiosity and engage with them. When it comes to food it’s a very basic need and you normally don’t think of it intertwining with innovative tech. But once it does some really unique brands are born. Experience a new approach to gardening focused on what you enjoy. Cultivate Personal Produce™ with SproutsIO, an automated indoor growing system. With SproutsIO you’re always growing. Enjoy the benefits of year-round, continuous access to delicious fruits and vegetables cultivated to your taste. Develop flavors that delight your senses and inspire your creativity. Uses technologically advanced, urban greenhouse facilities, located in NYC and Chicago to provide year-round, local supply of premium quality, pesticide-free produce grown with the highest standards of food safety and environmental sustainability. Uses exclusive technology to create edible food inks to print directly onto food surfaces and beverages to produce a high quality, edible image. They can print directly onto cookies, iced coffee, marshmallows, and more. Food Loves Tech Expo also featured this year, GE’s Connected Kitchen showed how to make the perfect pizza with Chef Duffy, rainbow pasta and Blue Point shared their mission-based beers, like the Good Reef Ale — brewed to help restore NY’s oysters. The Chobani Incubator also featured some of the most interesting new food brands at this expo such as I Heart Keenwah, Rind, Apiterra Honey and more.